LE BOURGET, France ? The United States and Europe are movingcloser toward a full-scale collaboration in Mars exploration but have agreed togo their separate ways, for now, in exploring the mysteries of dark energy,according to U.S. and European officials. The science directors of NASA and the European Space Agency(ESA) are scheduled to meet in England the week of June 29 to craft anagreement calling for NASA to launch Europe's billion-dollar ExoMarslander and rover in early 2016 aboard an Atlas 5 rocket that will alsocarry NASA's Mars Science Orbiter mission. In a June 17 e-mail response to Space News inquiries, NASAspokesman Dwayne Brown said a prospective agreement would require that ExoMarslose enough weight to fit aboard the Atlas vehicle with the NASA orbiter. "It will not be a simple task for NASA's orbiter tocarry thelarge lander ESA has designed," Brown said. "Detailed studies andanalyses are required. Also considered will be ... the difficulty of the 2016opportunity for landing due to orbital mechanics and dust storms." An Atlas launch would help solve a longstanding ExoMars financingproblem at ESA. The mission's current budget of 850 million euros ($1.185billion) ?is insufficient to finance the experiment payload and a launchaboard a European Ariane 5 rocket. ESA has said its current ExoMars budget isaround 200 million euros short of what's needed to pursue the mission withoutoutside help. ESA has been negotiating with Russia for a Proton rocketlaunch, and for the commercial purchase, in Russia, of nuclear heaters toprovide electrical power and keep the ExoMars rover instruments warm on themartian surface. Under the agreement now taking shape with NASA, ESA woulduse U.S.-built nuclear heaters, known as radioisotope thermoelectricgenerators. ESA Director-General Jean-Jacques Dordain, in a June 15press briefing at the Paris Air Show here, said ExoMars will be unable to carrya key science package ? the Humboldt suite of instruments to study martiangeophysics ? because of financial and weight-limit requirements. He voicedsupport for a long-term Mars exploration collaboration with NASA, starting withExoMars. 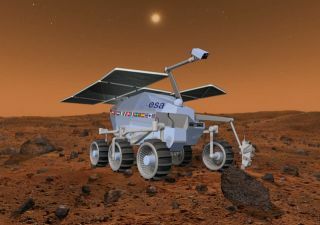 ESA Science Director David Southwood said he hopes aninitial letter of intent can be signed with NASA on an ExoMars collaborationduring his June 29-30 meeting with Edward J. Weiler, NASA's associateadministrator for science. NASA's Brown said the meeting might produce the outline ofsuch a letter, but that the two agencies "have not yet discussed anofficial letter of intent since the accommodation studies and independentreviews are not finished, and a final commitment on a 2016 partnership has notbeen made." Brown confirmed NASA's interest in making ExoMars "thefirst installment of a larger joint Mars exploration program between bothagencies ? a joint Mars Architecture looking at missions in 2016, 2018, leadingto a joint Mars Sample Return mission sometime in the decade of the 2020s.These plans are predicated on a successful 2016 architecture." "This is a courtship," Southwood said. "Whatwe hope to accomplish is something that would be terrific for Europe, and forthe United States. For a future mission like Mars Sample Return ? even theUnited States cannot do that alone." But if NASA and ESA are moving closer on Mars exploration,the two agencies will be pursuing separate missions to investigate dark-energysources. ESA has included the Euclid dark-energy mission among candidatemissions to be evaluated late this year for future funding. Southwood said hehas concluded that Euclid cannot be combined with the Joint Dark Energy Mission(JDEM) planned by NASA and the U.S. Department of Energy. The main problem, he said, is the calendar. Southwood saidstructuring a trans-Atlantic cooperative mission on dark energy in time to meetESA's competition deadline has proved impossible given the personnel changes inthe U.S. administration since January and the more-complex program managementowing to the Department of Energy's co-management of the program. Jon Morse, NASA's astrophysics director, agreed that integratingESA as a full partner in the mission would be a challenge that would requirehigh-level approval in Washington and at ESA and might threaten Euclid's placein the ongoing competition among future ESA programs. "They did not want to jeopardize Euclid's standing inthe competition" by starting a long process of ESA-NASA-Department ofEnergy negotiations, Morse said in a June 17 interview. "The discussionswith ESA have been deferred until the next steps [in ESA's futuremission-selection process], but this does not preclude a futurecollaboration." Morse said NASA's JDEM agreement with the Department ofEnergy, spelled out in a November 2008 memorandum of understanding, has notchanged with the arrival of the administration of U.S. President Barack Obama.The memorandum identifies NASA as overall mission manager, and says: "Inconsultation with DOE, NASA will investigate the possibility for internationalin-kind contributions. NASA will be the principal point of contact innegotiation and conclusion of international agreements related to JDEM." The Future of Mars Exploration: What's Next?